I really enjoyed this story for the characters were wonderful, Marlena had a very sad life and spirited and that’s how he remembered her. They sure had adventures but it turned out wonderful. I loved the characters in this series. I have enjoyed reading all three of these stories. 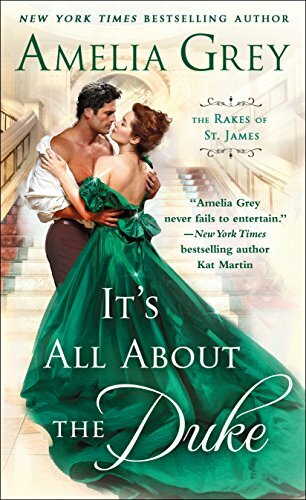 Amelia Grey has the gift of writing page turners. I can’t wait for the next book by her to come out. This is that last book of the series and it is about the Duke of Rathburne, who is trying to make amends for a wager that caused him and his best friends in an scandal. He is taking on a ward, who is needing a husband. Miss Marlena Fast is a very spirited. She was orphaned at a young. Marlena likes her independence and having a wicked duke being responsible for her is not ideal. He challenges her and she likes it, but she has to be careful because she has a secret of her own. I can’t wait for Amelia Grey to start a new series. The best thing about this book was tying up all the loose ends from previous books in addition to a decent story but the hero of this story seemed to be terribly constrained in actions not directly related to romance which I found a bit frustrating and the ending a bit too kumbaya for some of the side plots. So over all this was a good 4 Stars trilogy, I would recommend it to friends now that the whole thing is available but reading it one book at a time then waiting for the next one was not a pleasant experience so be aware that to really enjoy this trilogy to its maximum you do have to read the whole thing.